Did Jobs Grow Fast Enough In May? Probably Not : The Two-Way Economists expect to hear that a modest 150,000 jobs were added to payrolls last month and that the jobless rate stayed at 8.1 percent. They say employers just aren't adding jobs fast enough to bring unemployment down quickly. Hoping for work: Job seekrs lined up Thursday at a job fair in Los Angeles. The most-anticipated news of the morning is coming from the Bureau of Labor Statistics, which at 8:30 a.m. ET will tell us how many jobs employers did or didn't add to their payrolls last month and whether the jobless rate stayed at the 8.1 percent level it hit in April. NPR's John Ydstie tells our Newscast Desk that "according to surveys by news organizations, economists think the U.S. added between 150,000 and 160,000 jobs in May. That's better than the tepid job growth in the previous two months, but far below the 250,000-jobs-a-month increase experienced during the winter." Also, John says, at 150,000-a-month job growth isn't fast enough to bring the jobless rate down quickly. 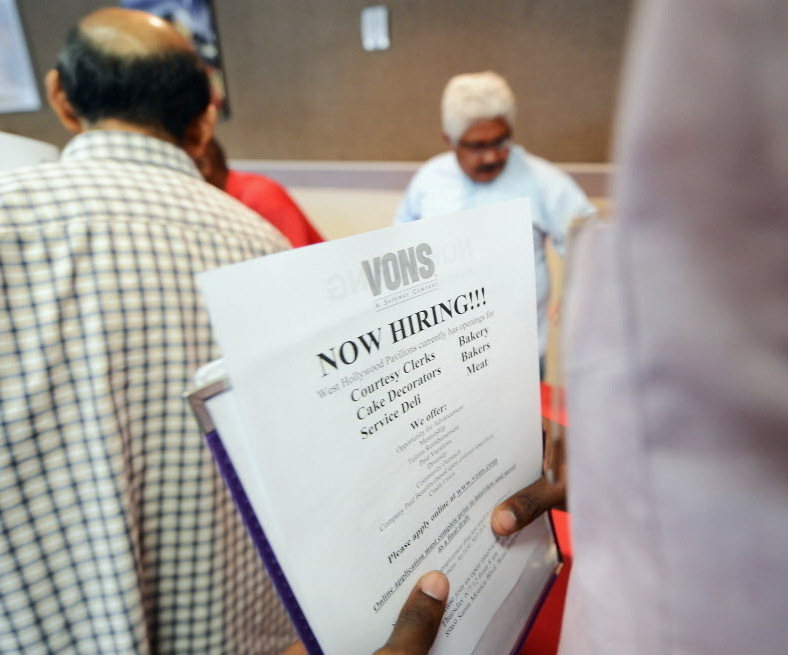 That's why economists think the unemployment rate remained at 8.1 percent last month. Stephen Stanley, chief economist at Pierpont Securities, tells Bloomberg News that 150,000 more jobs a month is a sign of an economy that's just "muddling along." The Associated Press cautions that "several reports Thursday suggested that hiring could be weaker than forecast. The number of people seeking unemployment benefits rose to a five-week high, a sign layoffs may have ticked up. And businesses added 133,000 jobs in May, according to a survey by payroll provider ADP. That was better than April's figure but not by much." Also weighing on the economy and the labor market, as AP notes: "The threat from Europe's financial crisis has grown in recent weeks. The crisis is driving up borrowing costs for Spain and Italy and spreading to the banking system. Greece could be forced to exit the euro, which would likely push the region into a recession. That could limit U.S. growth." We'll post on the employment news when the report comes out.